Hey I just wanted to post on here that I have my etsy shop up and running﻿ now. 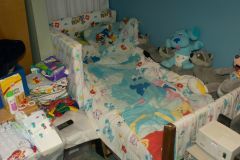 I make high quality abdl furniture. Come check it out. 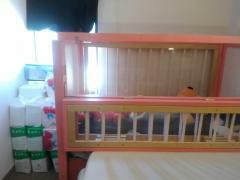 http://Www.thelittlesplace.com I currently have a drop side crib and highchair ﻿﻿listed. I hope this is in the right spot but I was wondering for those who have the aw so cute inflatable crib what parts do they not like on it? For me it’s the fact it’s a little too small, the spaces between the bars are too big and stuff slides out and I hate that you could only climb over the side to get in and out and i never felt comfortable inflating it all the way because I’d have to push it down. The crazy idea is that I want to design an inflatable crib of my own that not only solves these problems (bigger size,closer spaced bars and a door)but would have one of the ABU PeakABU characters ‘watching’ over you. Now for that I was originally thinking of having his neck and head coming out of the backboard but I think that would take up too much space and now pondering of making the actual headboard the character’s face.It would obviously be sold by ABU and I want it to be rated for 400 lbs for extra durability and would like it to be under $150 if it’s using the headboard as the face.What do you guys think? got this from the most kindest person ever. I finally opened my business in wood work. I build furniture galore and have been building cribs, changing tables, etc... 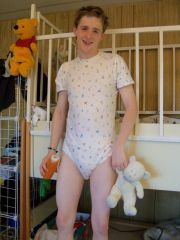 I really want to help out and build wooden adult baby furniture. I can deliver only to the United States and am interested in taking orders. I will literally deliver them in person if it saves you money or I can ship. I haven't come up with a cost yet, since this is all pretty new territory. I am based out of The Idaho, Utah area and have a great shop with tons of tools to make these pieces come to life for you! If you're interested, email me, I can see how detailed you want! 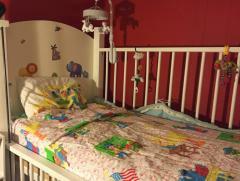 This is the crib that I put my little boy in every night. 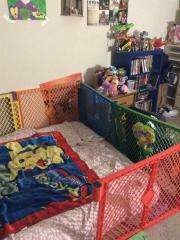 I also put other little ones in the crib, but usually just on days when my boy isn't home. Hopefully some day I will have an extra crib just for guests. So all I needed now is a door and I got my Newest crib!! !